Integrate STEAM in your school through arts-based maker projects using digital fabrication tools commonly found in makerspaces like 3D printers, laser cutters, vinyl cutters, and CNC machines. Full color pages showcase the artistic and technical work of students that results from combining art with engineering and design. The Art of Digital Fabrication makes the case for designing and making art with digital technology and provides the resources for bringing that work to life in classrooms and makerspaces. 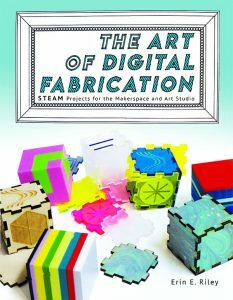 Written by an educator with extensive experience in art and maker education, this volume contains over twenty-five makerspace tested projects, a material and process inventory for digital fabrication, guides for designing with software, and how-to’s for using digital fabrication machines. This book will inspire those new to technology to get started with the tools for making, while offering experienced makers approaches for fabrication with materials found in the art studio. School makerspaces can integrate technology into curriculum while preserving the experimental approaches to materials found in the art studio. Merging art, design, and engineering process equips our youth with a broad vocabulary for creative and technical skills for making. *I love this book!! * It provides a vision of maker education that is completely original and mind expanding. The book is gorgeously designed, as well as brimming with ideas and projects. The projects themselves are wonderful—Erin’s work, and that of her students, is utterly unique and beautiful. And, there is so much here! Each project is full of revelations—particularly about inventive uses of tools and materials—and there are so many of them! It would take years of exploring to do justice to all of the ideas and techniques covered in this book. – Leah Buechley. Inventor, artist, educator. Available for pre-order soon at Barnes & Noble online and Amazon.com. Sign up for the newsletter below to be notified about the publishing date.